It boggles the mind. Having grown up with a mother whose classic sense of Mediterranean and contemporary style often had my friends declaring that my house was ‘the most beautiful house I’ve ever seen’ has made me a decorating snob. The whole ‘whimsical country’ decorating craze that sweeps from coast to coast every few years tends to make me cringe. Cows wearing sunhats, little pigs pushing wheelbarrows and chicks and ducks as salt and pepper shakers on my table or sideboard just leave me completely cold. What a surprise! 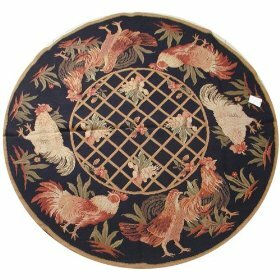 There were indeed 25 different styles of rooster rugs, and to the astonishment of my turned-up nose, most were NOT the kitschy style that is usually associated with poker-playing dogs and velvet Elvis wall hangings. Instead, I found a selection of beautifully crafted and designed area rugs to suit many different decors – and not a single one that screamed ‘tacky’ or ‘camp’. These were rooster rugs that would be perfectly at home in my mother’s unique contemporary/traditional blend style of decorating. A particular favorite – one that I’d even buy if I were in the market to redecorate at the moment – is Claire Murray’s French Country collection of rooster rugs. Available in several different colors, the border of roosters on the rug resembles a stamped design that surrounds a field of stylized flowers on a cream-colored background. 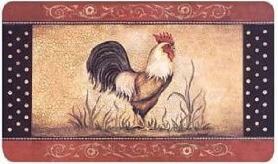 It’s a country rooster rug – but with that indefinable sense of French flair. 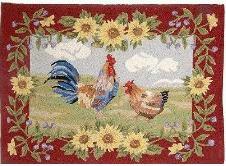 Then another rug caught my eye, the Accents Decorative Rooster Design Wool Rug By Valerie its border of warm sunflowers and a central motif of stylized roosters, the rug has the timeless appeal of colonial styling blended with a hint of contemporary that makes it a perfect fit in a modern country kitchen. And then I was stopped dead in my tracks by a stunning Oriental style rooster rug that made me redefine my entire line of thought. Oriental rooster rugs, it turns out, have a long history. The rooster is one of the Chinese astrological symbols – 2005 was the last Year of the Rooster. The rooster is seen as an all-seeing, vigilant guard who aggressively defends his home and his family – but is also kind and trustworthy. Roosters, it seems, have been perched on roof vanes and mounted on front doors for centuries to help guard the house and drive away bad luck. So it’s no wonder that – unlike cutesy cows in sun hats and pigs toting market baskets – roosters are a decorating motif that fits into the most sophisticated of decorating schemes. Believe it or not, you really CAN find rooster rugs that will accent your modern contemporary dining room – and why not? Would you turn your nose up at one of the animals that the Chinese consider ‘the most noble of birds’?